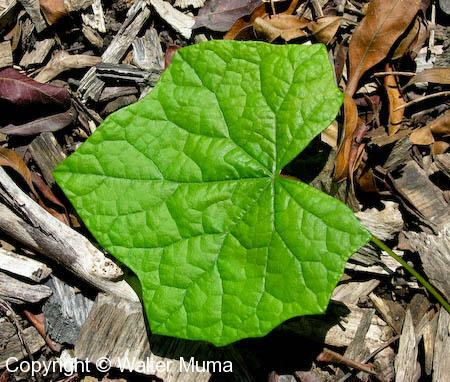  Riverbank Grape (Vitis riparia) - Leaves similar. Seeds are not crescent-shaped and are edible. Vines have tendrils. Poisonous: Fruits are poisonous. They resemble those of wild grapes. Photographs: 68 photographs available, of which 7 are featured on this page. SCROLL DOWN FOR PHOTOGRAPHS. Sometimes the leaves are not as lobed. Canada Moonseed trailing up a tree, very similar to grape vines. 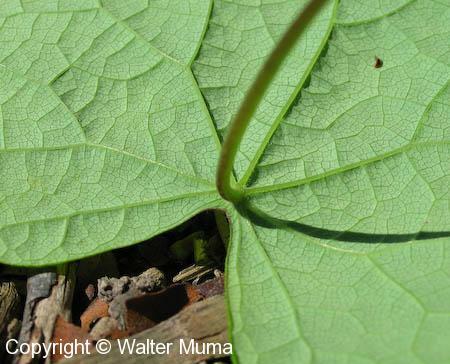 This is one of the distinctive features of Canada Moonseed leaves - the leaf stem (petiole) attaches to the leaf just in from the leaf edge. This helps to distinguish Canada Moonseed from Grapes. Unripe fruit in late August (sorry, the photo is slightly out of focus! ).